Automated Daily Income Review - A Scam to Avoid! I’ve finally gotten around to write an Automated Daily Income review, since a few of my readers have been asking for it. The Automated Daily Income system (also known as ADI system) introduced by Raena Lynn claims to be a link-posting online job, but don’t be fooled. It’s one of many online scams that give false information and unrealistic promises, so it’s best to exercise caution and analyze it carefully before jumping the gun. In this in-depth Automated Daily Income review, we’ll reveal how the scam works, what you will get if you pay the $49 fees for their training course, and most importantly how to avoid online scams in the future and how to make real money online. 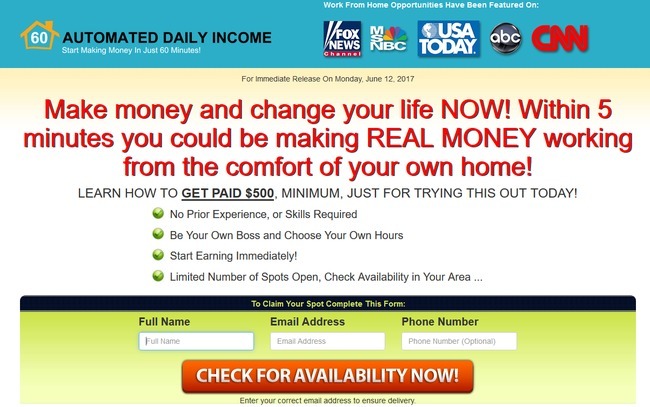 If you thought Automated Daily Income was a legitimate program that lets you work at home and fire your boss, I’m sorry to say that you are gonna be disappointed. Of course, we don’t want to dismiss the business opportunity without any evidence, so lets take a look at what it offers. From the surface, it appears that the ADI system might be legitimate since it’s featured in various news channels (Fox News, USA Today and CNN). But is it really the case? Was Automated Daily Income really featured on news channels? Take a close look again – on top of the logos it’s stated that “Work From Home Opportunities Have Been Featured On”, which is a general statement and does not imply that Automated Daily Income was one of them. It’s a clever wordplay and most victims would take it as an endorsement from various news channels. “If it’s featured on the news, it can’t be a scam” is a dangerous mindset to have in this case. Do these templates look familiar to you? 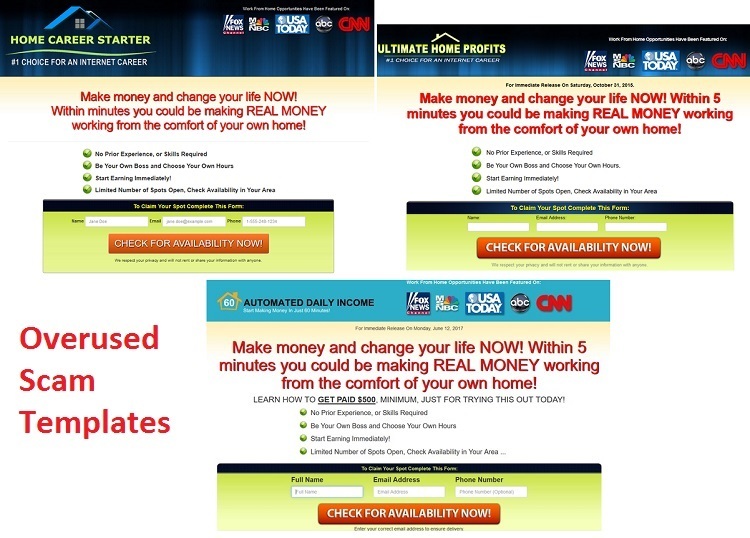 If you have come across Home Career Starter (read review) and Ultimate Home Profits (read review) scams before, you will immediately recognize the similarity of their homepages to Automated Daily Income. Both have been debunked as online scams and we have also received multiple comments from our readers reporting their bad experience with those programs. It’s not uncommon for these online scams to establish a lot of duplicate websites (same content with different names) so it’s hard for us to track and expose them. This brings us to the next section – exposing the fabricated identity used in the sales pitch of Automated Daily Income scam. In the sales page of Automated Daily Income, we were introduced to Raena Lynn, a single parent who found her way to financial freedom using the highly profitable ADI link posting system. Again, if you come across enough online scams, you will realize that single, work-at-home moms are always used in online scams to entice people who want to make easy money from home (especially work at home moms). So who exactly is Raena Lynn? I’ve done a simple reverse image search based on the picture provided on their website, and here’s what I found. The image featured in Automated Daily Income was obtained from iStock, a stock image vendor website selling professional photographs to be used for commercial design purposes. In other words, the scammers behind ADI system used a stock image and fabricated an identity for her to portray as the spokesperson of the scam. Raena Lynn does not exist, and nobody has made any money using the Automated Daily Income system (except for the scammers behind ADI system making money off their victims). Can You Really Make Money Just by Posting Links? Is making money online as easy as posting a few links a day? Automated Daily Income wants you to believe that making good money online is as easy as sparing 60 minutes a day and posting a few links for the big companies. This kind of unrealistic work input vs. earning potential is exactly the red flags that you need to look out for in online scams. They want to make it sound as effortless as possible so you will pay them money to learn their “secrets”. I’m not saying that these figures are unrealistic, in fact a lot of internet marketers are generating way more than this amount. However, you can’t expect to make hundreds of dollars a day just by sparing 60 minutes a day. Even experienced internet entrepreneur put in hard work to generate big income online. People buy products from you. Do you think it will work? Hell no! Your website won’t even appear in Google search results because a website full of affiliate links and don’t provide value will be regarded as spam by Google, and you won’t be ranked in the search results at all. Secondly, even if someone miraculously lands on your website, what do you think he/she will do? Buy the first product they see on your site? Of course not! There’s no reason to buy from your site at all! If they really want the product, wouldn’t it be easier to buy directly from reputable websites like Amazon.com? The truth is, the ADI system is just a sales funnel designed to sell you a pyramid marketing scheme known as My Top Tier Business (MTTB) and My Online Business Education (MOBE). I’ve written a very detailed review on both MTTB and MOBE, and it’s clear that the program is not for everyone. If you decide to buy the Automated Daily Income system, you will be redirected to the sales page of MTTB instead, which is a 21-steps training program that costs exactly $49. However, it has nothing to do with link-posting at all. MTTB is a high-ticket item multi-level-marketing program, where you need to buy products worth thousands of dollars and resell them to other internet users. The required investment is not just $49 as you were led to believe. You will need to pay an additional $19.95/month just to stay as a MOBE member and promote their products, even if you don’t make any money from their program. On top of that, to really make MTTB and MOBE work, you need to have substantial online marketing experience and a big budget to work with. Obviously, Automated Daily Income scam was a sales funnel created by one of the MOBE affiliates trying to recruit members as his/her down-lines. Remember that MTTB and MOBE is a multi-level-marketing program? By purchasing MTTB through the affiliate behind Automated Daily Income, you become his/her down-line and he/she gets a commission if you eventually buy a basic MOBE license that costs $2,497. I have nothing against MOBE affiliates, but Automated Daily Income misguides unsuspecting victims using a bait-and-switch model to trick them into buying MTTB and MOBE instead of the link-posting course promised in the sales pages. This sales method in itself qualifies Automated Daily Income as a scam, as it gives false hope and information, on top of hiding the true nature of the program. Should You Buy Automated Daily Income? The answer is clear. The final verdict is NO, AUTOMATED DAILY INCOME IS A SCAM! Thank u sooo much!! You have saved my life from regret, money lost and drama. I knew it was a scam because it sound too good to be true. And then after trying to sell you on how much money you can make..blah, blah, blah..and then bam, pay $49 dollars..i had to know if it’s real or not..so thank u for taking the time out to do the research and then have it available for ppl like me. I truly appreciate you. Hey Sharon, glad it helped you! I got a bit skeptical when the program I purchased turns out to have a different name (MTTB instead of Automated Daily Income), and then I found your review that cleared everything up! Try to get a refund from Clickbetter as they are the vendor of Automated Daily Income.